Description: Located on a charming tree-lined street in Rosedale ~ a neighbourhood boasting excellent public and private schools, recreational facilities, within walking distance of local shops and fine restaurants, the convenience of public transit and easy access to both the downtown core and the major arteries out of the city. The spacious formal living and dining rooms enhanced by oak hardwood floors, wood-burning fireplace, bow windows and crown mouldings set the stage for gracious entertaining, while the kitchen with breakfast bar offers venues for more casual gatherings. A graceful oak staircase leads to the private accommodations which include a master suite with plenty of closet space, two additional bedrooms and a library embellished by built-in shelves and wood-burning fireplace. The third level offers a large bedroom, three-piece bath and large storage closet. Additional highlights include a double car garage and private drive. Private enclosed gardens enchant and delight creating a private oasis in the heart of mid town Toronto. 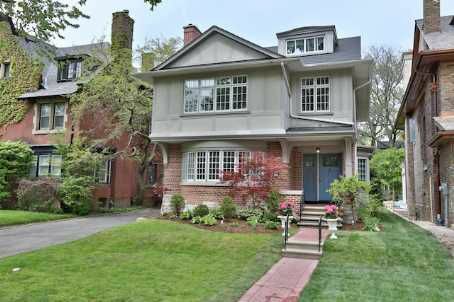 A much sought after family home in a very desirable neighbourhood.